To improve guests experience- we will be renovating guest rooms and hallways from February 20 - April 21. We apologize for any inconvenience The Hampton Inn Raynham-Taunton MA hotel is located on Route 44 in Raynham Massachusetts in the Raynham Corporate District adjacent to Raynham Woods. 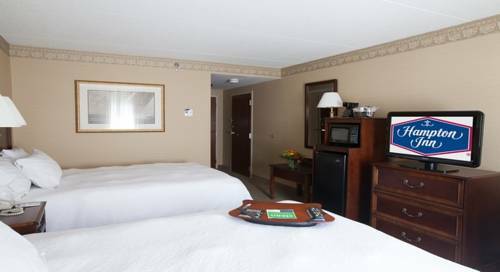 Our hotel is conveniently located 35 miles from both Providence and Newport Rhode Island as well as Boston Massachusetts. This Hampton Inn hotel features our complimentary **On the House** hot breakfast high-speed internet access throughout the hotel 24 hour business center indoor heated pool whirlpool area fitness center two story atrium lobby Suite Shop and meeting room that can accommodate up to 50 people. We love having you here at the Hampton Inn Raynham hotel in Massachusetts. Bob Waterman has transformed his old farm property into a kind of Pee Wee's Playhouse bird sanctuary. The decor features lots of yard sale reject toys: stuffed animals and plastic Santa and snowmen.